From left: Peh, Lee, and Koo. 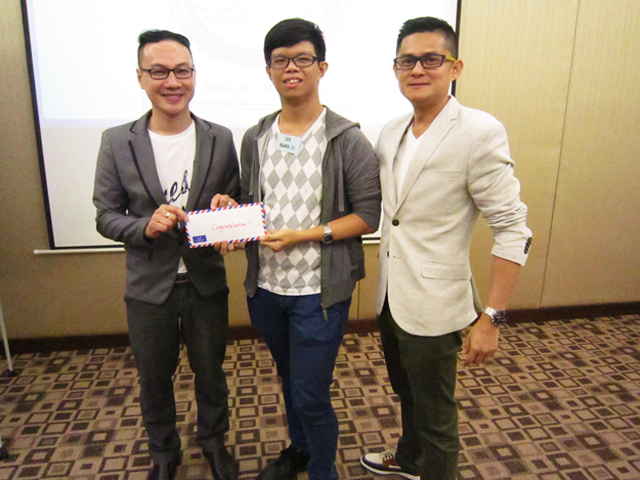 UTAR student, Lee Kwan Li won the Cashflow competition held at the Cash Flow Workshop held on 20 June 2015 in Jaya33 mall, Petaling Jaya. The Cashflow competition was basically a financial board game introduced to participants during the workshop. A total of seven students from UTAR attended the workshop sponsored by Dnity Advisory Sdn Bhd and Evoque Advisory Sdn Bhd. The event was also attended by other students and the public from different industries including actuarial science and engineering. The workshop commenced with ice-breaking games and continued with talks from two seasoned speakers with more than 10 years’ experience as entrepreneurs in the financial sector. The first speaker was the humorous Koo Chen Theng, who enlightened his audience with stories and explanations on cash flow concepts. There was also an interactive component to the talk where participants were given the chance to share their decision-making thought process during the game. This was followed by the energetic speaker Jordan Peh Kian Hong. His talk centred on the mind sets of entrepreneurs and greatly moved the audience with his positive energy. The workshop came to a close with the awards ceremony for the Cash Flow game where UTAR student Lee Kwan Li was chosen as one of the winners and walked away with a RM1,000 cash prize. Five other UTAR students were also invited to have an exclusive dinner with the speakers.